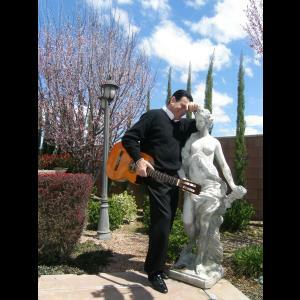 Pino is an accomplished acoustic guitarist and singer, providing romantic music for that special occasion. His versatility of musical genres, including new age, latin, bossa nova,nuevo flamenco and pop, as well as a full repetoire of traditional Italian music, makes him the perfect choice for weddings, anniversaries, birthdays or other parties and events. Whether its vocals or instrumental you are looking for, Pino can prepare the perfect program to meet your desires. Coupled with his musical talent, Pino's energetic style and charisma provide the tools needed to enliven a party and make the event truly memorable. When time for a romantic interlude or theme, no one sets the atmosphere better, with just the right love song or tune. 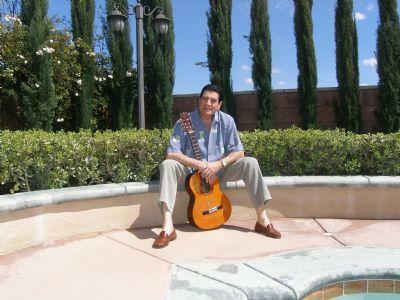 Playing and singing since he was a teenager, Pino is a seasoned entertainer and delivers quality professional musical service for your wedding or event. Pino was the icing on the cake for our party, which was to celebrate our France wedding, six months ago. We had an awesome caterer and florist, so just needed to romanticize the evening with some flamenco guitar. Pino plays "happy music" that always makes people smile. He came early to get the lay of the land and only needed a stool and space for his amp. My guests really enjoyed our wedding party because of him. Highly recommend him if you're looking for a romantic evening! ALL I CAN SAY IS MAGNIFICENT!!!!!!!! Pino's music added alot to our wedding ceremony. His music captivated us all and added so much more depth and emotion to the occasion. I felt I was starring in my own romance movie. I'm so glad we hired him. He truly went above and beyond the call of duty, and gave us our money's worth. I'm eternally greatful I found and booked him in time. I can't wait to get the wedding video to relive the magic. Pino arrived early and left late! Everyone was extremely pleased and all left with one of his CD's. An amazing talent and he left the women swooning! Pino is a MUST and he will play for us many more times in the future. He instantly became a member of the "family" and provided top-notch entertainment throughout the evening, taking only one small break. No one left without shaking his hand and he was applauded by everyone at one point in the evening. My highest recommendation! He made our party a huge success! I cannot begin to explain how much I appreciated Pino's talent and professionalism. It was so wonderful that I did not have to worry about the music. Pio just handled the entertainment and freed me up to the 100 other things I needed to attend to. Having him there put my mind at ease. 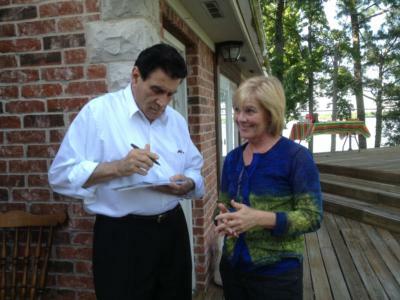 The responses from our staff and clients that attended were overwhelmingly positive of Pino's performance. His style was so soothing, relaxing, inviting and beautiful. I could not have asked for a more perfect evening and Pio was a large part of its success. He traveled from TX to OH in the middle of a major lake effect storm, but he managed to get to the event before me! Everyone LOVED Pino's music. He gave just the right ambiance to the wedding ceremony. My grandmother in particular was a big fan and went up a couple times (from what i heard) to make special requests. I myself didn't get to enjoy Pino's music at the wedding cocktail hour because the bride and groom were scheduled to arrive close to the finish. However, all of our guests really loved Pino. I am so glad that we chose him over all the other guitar players out there. I hope to hire him again for any future events. Thank you Pino for making our wedding so lovely! We heard Pino play one night at an italian restaurant and knew then we had to have him play at our wedding. Pino did an amazing job, both for the wedding and the reception. We had so many compliments on his music. He made the wedding feel so intimate and added such a unique touch to the reception. He was so excited for the event and made this such an easy experience. My only complaint is not a complaint at all - I just wish he would have sang more becasue he has such a beautiful voice. Brides-to-be - he is amazing! Just make sure he sings...a LOT! You'll love it! Thank you Pino! Pino was the perfect choice for our corporate event. He provided beautiful background music and my guests all commented on how great the music was - normally this doesn't happen. The music fit our theme perfectly. Pino was very easy to work with and delivered exactly what I wanted. I will definitely hire him again and recommend him. Wow!!! Pino definitely set a relaxing and enjoyable ambiance for my ceremony and reception. Beautiful singing and talented guitar playing. I recieved nothing but great compliements. He truly looks like he loves what he does and enjoys every minute of it. Thanks so much Pino for making my wedding so beautiful and memorable!!! Please note Pino De Fazio will also travel to Roanoke, Grapevine, Colleyville, Flower Mound, Keller, Bedford, Hurst, Coppell, Dallas, Euless, Fort Worth, Lewisville, Argyle, Haslet, Irving, Richardson, Arlington, Justin, Lake Dallas, Denton, Farmers Branch, Grand Prairie, Carrollton, Addison, The Coloney, Rhome, Little Elm, Newark, Ponder, Kennedale.